It's that time of year. There's frost on the grass in the morning and the trees grow more and more bare each day. People are packing for holiday traveling; to home, to tropical resorts, or to Light Grey Art Lab for Light Grey Game Night! Mark your calendar for Wednesday, November 12th from 6:30 to 9:30 PM! As you might remember, we're attaching a theme to each night to help people narrow down what games they might want to bring (although you're still welcome to bring whatever you'd like!). This week's theme is On The Road! 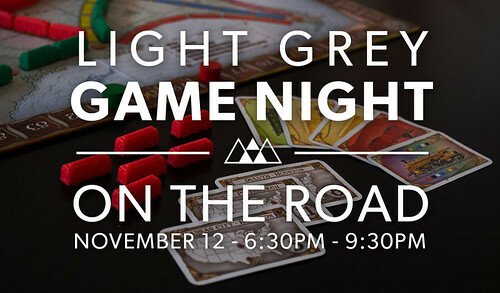 We'll be playing games about planes, trains, automobiles, and any other way you might choose to travel! Plot the best route in the classic game Ticket To Ride, take tourists sightseeing or dive for hidden treasures in Key Largo, or take a leisurely hike down the coast of feudal Japan in Tokaido, among plenty of others! If you have a favorite boardgame, bring it!